According to a new study, the use of the e-cigarettes among teens tripled between 2013 and 2014. The increase is such that e-cigarette use, or ‘vaping’, has surpassed that of cigarettes and all other tobacco products. This is also due to the decrease in use of traditional cigarettes, which fell to a reported 9.2% usage among teens surveyed; e-cigarettes stand at 13.4%. So why are e-cigarettes becoming so popular among teenagers? One reason may be linked to the flavour of the product. More than half of teenagers who smoke traditional cigarettes have said that they preferred ones with sweet flavours, such as bubblegum. E-cigarettes also come in a variety of flavours, such as cotton-candy, coffee and chocolate, and are also more easily attained than traditional flavoured tobacco. We can therefore apply the same link between tobacco and flavouring to e-cigarettes and flavouring. Worryingly, the chemicals used for these flavours have been found to be respiratory irritants, but there has been very limited research into the actual dangers of this. Marketing is also being accused of being behind the rise in teen vaping, with the products often being advertised in shopping malls and sweet shops, where teens are likely to be found. While this poorly veiled technique is worrying, perhaps what is more concerning is the implication that e-cigarettes are simply a vapourised sweet, available in all your favourite flavours. It certainly distances itself from the notion of inhaling an addictive drug, and while I am neither for nor against smoking of any kind, I do believe that information and transparency should exist, particularly when youths are involved. With almost half of current users disagreeing that there are any health risks at all, this doesn’t seem to be the case. With the social acceptance of smoking traditional tobacco declining over the past 50 years, it is interesting to note that the social environment is actually a booster in vaping, with the majority of student vapers stating that their friends approved of the practice. One concern related to this is the potential for vaping to become a “gateway” to traditional cigarettes. 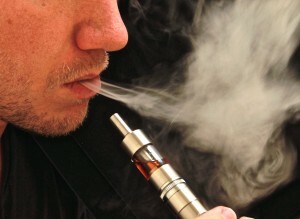 While e-cigarettes don’t contain tobacco they are still a source of nicotine. As an addictive drug, the increase in its use among teens is problematic as there is evidence to suggest that this age range is more susceptible to addiction as their brains are still developing. This adds some credibility to the idea of e-cigarettes being a gateway drug, as it is more likely to lead to lifelong addiction at this early stage in life. Apart from addiction and the immediate effects of nicotine on the body, it is still unknown what the long-term consequences of vaping are, with health bodies calling for more research into the area. Marketed as a cessation aid, data collected in 2012 in 27 European countries found that only a small minority of users used it for this purpose. The countries where vaping was found to be most popular were Denmark, Czech Republic, Poland and Bulgaria.